Ever since the start of the program, I have been eating my bodyweight in food every meal. I admit I do have a big appetite, but Chinese culture has had a lot to do with it. Our average meal consists of multiple dishes that everyone shares. Family style. Usually, people share a variety of main dishes (kungpao chicken, steamed pork, and if we are lucky, kaoya or Beijing duck), vegetables (broccoli or sautéed cabbages), a tofu dish, potatoes, and a 主食(zhu shi, staple food) like rice or noodles. 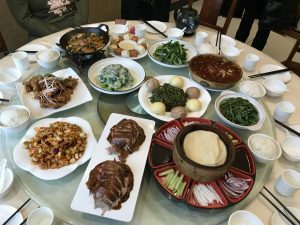 At most restaurants in Beijing, we sit at a round table where all the dishes are on a Lazy Susan (turntable). When everyone is trying to grab food from a plate before someone spins the table, things can get pretty crazy. It’s a game between people who want to spin the table and those who are trying to grab as much food as possible before they do. The result? Awkward moments of people eyeing each other and waiting for a dish to come around. It gets even more awkward when you’re grabbing food and someone decides to spin the table so you end up getting hold of only a sliver of meat or a piece of broccoli. I’ve found a way to get around the hassle of waiting, which is to grab how much I think I can eat of every dish during the first round. More often than not, I overestimate how much I can eat when I’m hungry. By the end of a meal, I am struggling to digest an overbearing amount of food. Besides sharing, the amount of food we order is a lot to begin with. When we go to a restaurant as a large group, the teachers order the dishes they want us to try. This usually means 7-9 different full-portioned dishes that are famous in Beijing. “丰富” (fengfu) or abundance is particularly important in Chinese food culture because it is a way of demonstrating wealth, thanks, and care. Food is considered to directly affect a person’s wellbeing, which means treating someone to a nice meal is the best way to show gratitude and care. This is why Chinese people often greet each other with “Have you eaten yet?” rather than “How are you?” For example, when I first met my host family dad, he asked if I had eaten. He was eager to treat me to meals every other time we met. So when the teachers order, they are most likely to order more than we can eat to show that they care about us. They often say, “Eat a lot and study hard!” This usually means some leftover food at the end of the meal. I think it’s pretty unique to Chinese culture that leftovers reflect that everyone has had plenty of food. Not to say that wasting food is encouraged or supported in Chinese culture, but more of an inevitable result of the food culture that stresses abundance. 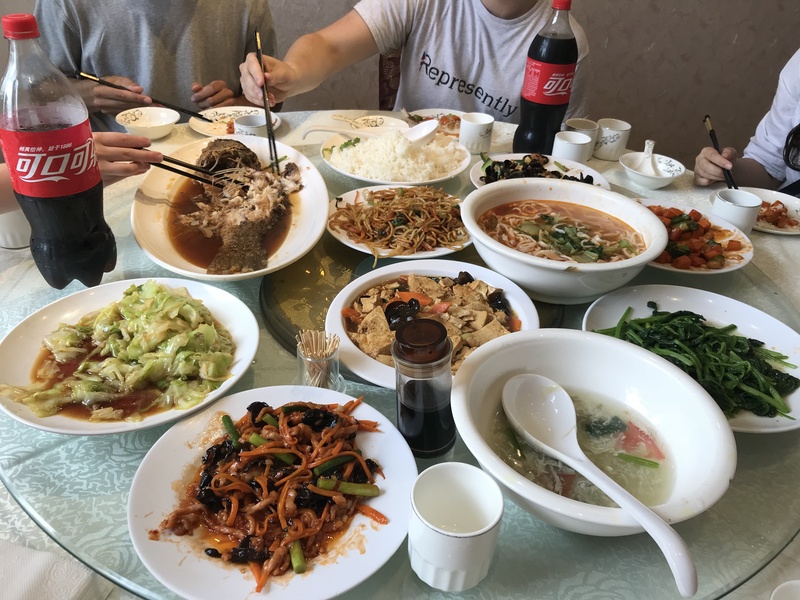 I’ve also been eating more than I can stomach because Chinese food culture involves “劝酒，劝菜” (quan jiu, quan cai), which means “offer drinks and offer food”. It is customary for adults to say “eat more, eat more” and pour us alcohol or pass over a plate of food. My language partner did this in a much more explicit way by placing food directly on my spoon. At first I was startled because I was incredibly full and didn’t think I could possibly fit more food in my stomach. The teachers warned us at the beginning of the program that our host families and language partners would consistently offer food and alcohol. We slowly learned that the best way to deal with this situation was to accept once and then politely deny the rest. I, for one, cannot say no…so in went the food. A short blurb on food symbolism in China: Some foods symbolize concepts like longevity, luck, good fortune, and wealth. For instance, the character for fish “鱼”(yu) is pronounced the same way as the word “余” (yu) for fortune. On special occasions and holidays like New Years, Chinese families eat fish and wish each other good fortune for the coming year: “年年有余” (nian nian you yu) is wordplay for “may every year end with surplus” or with fish. 1 Comment to "Eating on a Lazy Susan"
By Millie Kim, thanks for the article post.Really thank you! Great.